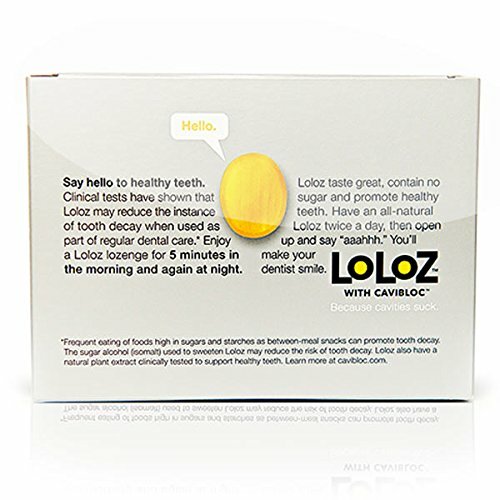 Loloz are the first lollipops and lozenges that can reduce the levels of bacteria known to cause cavities, gum disease, and bad breath. Active ingredient Cavibloc is a specific herbal formula extracted from licorice root that targets and disables the major organisms (Streptococcus mutans and Sobrinus, along with Lactobacilli) that cause tooth decay. This remarkable ingredient not only kills the bacteria that can lead to dental cavities, there is no need to take it every single day - Loloz actually prevents new bacteria from forming for up to 6 months after completing the 10 day regimen. If you have any questions about this product by HealthyGrid, contact us by completing and submitting the form below. If you are looking for a specif part number, please include it with your message.